Morecambe bid to win three consecutive league games for the first time this season when they host Lincoln City tomorrow. Back-to-back wins at Port Vale and Oldham Athletic have lifted the Shrimps to 20th in the League Two table, six points clear of the drop zone with 13 games left. They come up against a Lincoln side which leads the division and is unbeaten in its last nine games, six of which have ended in draws. 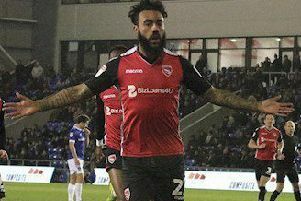 Both of Morecambe’s recent victories have come courtesy of late goals from new signing Aaron Collins. However, as Bentley was keen to stress, Tuesday’s win at Oldham was a game where everyone played their part – particularly his three substitutes. 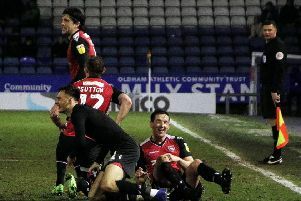 Jordan Cranston had given the Shrimps an early lead before Jose Baxter got the Latics on level terms in the second half, only for Collins to strike in the 89th minute. “You’re away from home, you have to dig in and show character,” Bentley said. “It doesn’t matter whether it’s the first minute or the 90th, whether you’re on top or under the cosh, you have to play with heart, desire, make sure you stay focused at all times and that’s what we did. “Every manager will tell you it’s hard to keep lads who aren’t involved happy,” Bentley said. “Suddenly we bring Rhys Oates on who was excellent, Liam Mandeville’s great turn in the box takes him away from two defenders, draws another one out of position and then it’s his weight of pass into Aaron Collins and he’s your third sub. “Over the last few months, it’s been a case of wrapping them up.